Last week I met up with some old school friends in Winchester for a reunion. We were at school in Southampton, but I was later an art student in Winchester so I was keen to go back for lots of reasons. We had lunch and a catch-up in a restaurant nearby and then set off for a guided tour given by one of our number who has blossomed into a qualified Cathedral tour guide! She told us that during the war the school was evacuated to Winchester and the girls went to live with the families of the clergy that lived in and around the Cathedral Close. Conditions were pretty stark, cold, spooky and scary I believe. But there were embroidery classes run by Louisa Pesel (1870-1947) an International expert in design and stitching and the first president of the Embroiderers Guild of England. The Dean had asked Miss Pesel to organise a project to produce needlework cushions and kneelers for the Cathedral quire and some of these were stitched by girls from my old school. Their designs were based on ancient floor tiles in the Retrochoir, but the undersides of their cushions were all embroidered in green and gold – our school colours. 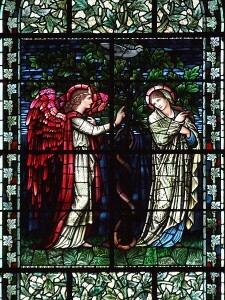 They are now in the Epiphany Chapel. I’m sorry, no pictures. I never remember to whip out my phone/camera when I should. High above them are stained glass windows by Burne Jones, made in the William Morris workshop with the familiar Morris stylised leafy tracery above and below..
What illustrious company for the schoolgirl’s needlework! 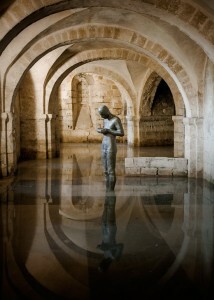 There are many, many fabulous treasures at the Cathedral but the most recent is in the Crypt which regularly floods. There is an Antony Gormley figure (himself) donated by him to the Cathedral. He is holding a cup and when the crypt floods, water rises up inside the figure and emerges through a small hole in his chest to fill the cup. 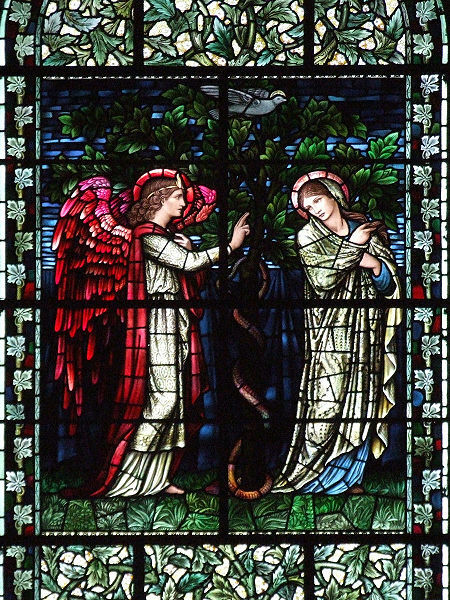 We had a fabulous day in Winchester, but I think the fine needlework done by the girls of my old school in the early 1940s in the chapel lit by the William Morris windows was the highlight for me.